Books on designing typography are difficult to come by. As a niche topic typography books are typically not carried at most major retailers. If there are books about typography it is often about how to use typography instead of how to create it. 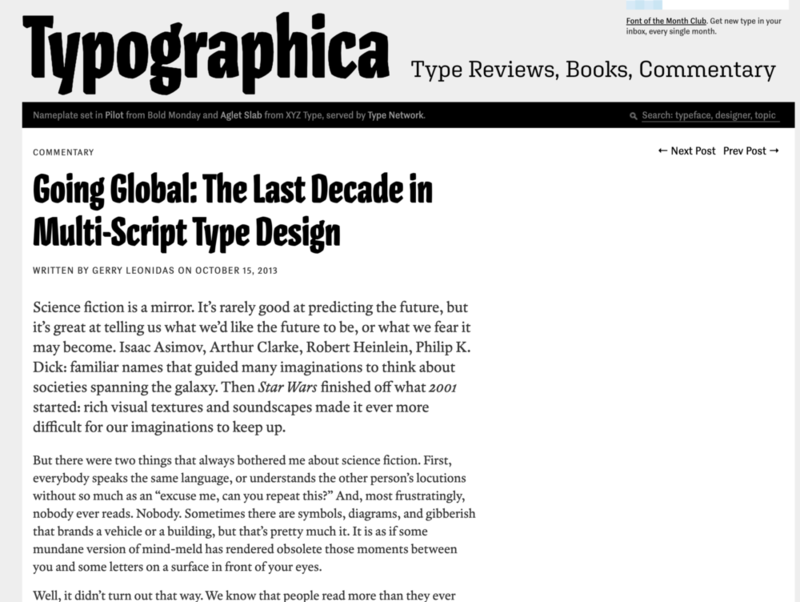 Therefore, I am creating an ongoing list of the best books and articles about typography. I will continue to update this list as I find more articles and books that I think are valuable. This list will be divided into a few different sections: Introduction to Typeface, which is the best place for beginners to start. Non-Latin Typography, addressing topics in designing for non-Latin scripts, and Technical aspects of typeface design. Some articles may span a few different categories but I will put them in the section where they are best suited. This section is for people who are interested in learning about typeface design. Maybe you want to learn more about the topic, or you want to begin designing your own fonts. Either way this section will provide you with some books and resources that are great for beginners. They are also books that everyone who wants to be a typeface designer should read as they provide a good foundation in the theory and idea of typeface design. ﻿This book is a great foundation for the field of typeface design. Gerard Unger was a prolific typeface designer. Unger received his Ph.D. in typeface design and taught at the University of Reading. His book introduces the major facets of typeface design such as spacing, consistency, tools, history, etc. This book is also a great book for non-typeface designers who want to know more about the field. Unger even recommends that if your mother wants to know what typeface design is that “Theory of Type Design” is the book to give her. The writing is easily approachable which makes the book a pleasure to read. The examples inside the book are applicable and illustrate the topics nicely. Luna’s book is a great pocketbook that highlights the important topics in typeface design. It is part of a series of books by Oxford Press. Paul Luna, another teacher at the University of Reading, highlights all the important details of typography. This book spends more time on the historical aspects of history than the Theory of Type Design. Once again this is a great book if you are interested in the topic of typeface design, but it doesn’t provide information on executing typeface design. The Golden Thread is the complete and best history of western typography. If you want to learn about the history of typography this is the must-read book. The book is engaging and well written, it covers the complete history of western typography up until digital typography. Ewan Clayton has a fascinating story; he grew up in England and became interested in typography before became a monk at a monastery. After learning the monastery Clayton went to work for Hewlett Packard to help them with their typography. While history isn’t always the most interesting part of typeface design, though The Golden Thread is engaging, knowing the history of typography is important when designing typography because it provides context for the work as well as helps clarify the nature and evolution of the shapes we use. The Stroke: Theory of Writing is a famous book on typography where Noordzij proposes terms to describe different letter shapes based on their relationship to the pen. There have been a few editions and translations of The Stroke, the best translation was the first edition. Since The Stoke is currently out of print it was just announced that the Stroke is going to be reprinted. I will update this post when you are able to purchase this again. These books and articles address more technical aspects of typeface design. They deal with more specific details in typeface design. They are more advanced and introduce theoretical ideas in typography or specialty skills such as spacing, legibility, or punchcutting. Counterpunch is a quick read that provides the history of punchcutters, and how metal type was created. Punchcutters take a unique approach to typeface design, instead of focusing on the black parts of type they focus a lot about the counters, the open inside of the shape. This provides a unique and useful approach to designing typography. Counterpunch is currently out of print. I will update this when it comes back into print. Fred Smiers is a famous typeface designer having started a few foundries. He also has cut punches and metal type in the past. This book is invaluable. Designing Type straddles two categories as it provides a technical look at each letter in the Latin language which makes a great book for beginners. If you are just starting out and want to design a typeface I highly recommend using this book as a reference. It breaks down each letter making it less intimidating when designing letters. These books and articles have to deal with designing for scripts that are not Latin. Non-Latin scripts is an emerging part of typeface design as many non-latin scripts have been neglected up till this point. These books and articles deal with problems in designing for other scripts as well as considerations to think about when designing non-Latin scripts. This is a great article that talks about non-Latin typeface design, it's importance as well as where typography is going particularly with relation to design for other languages. Non-Latin typeface design is the largest growing market in typography because it has been an underserved market for so long. Gerry Leonidas is currently in charge of the Masters of Arts in Typeface Design at the University of Reading. He is also currently the president of ATypeI (Association Typographique Internationale). 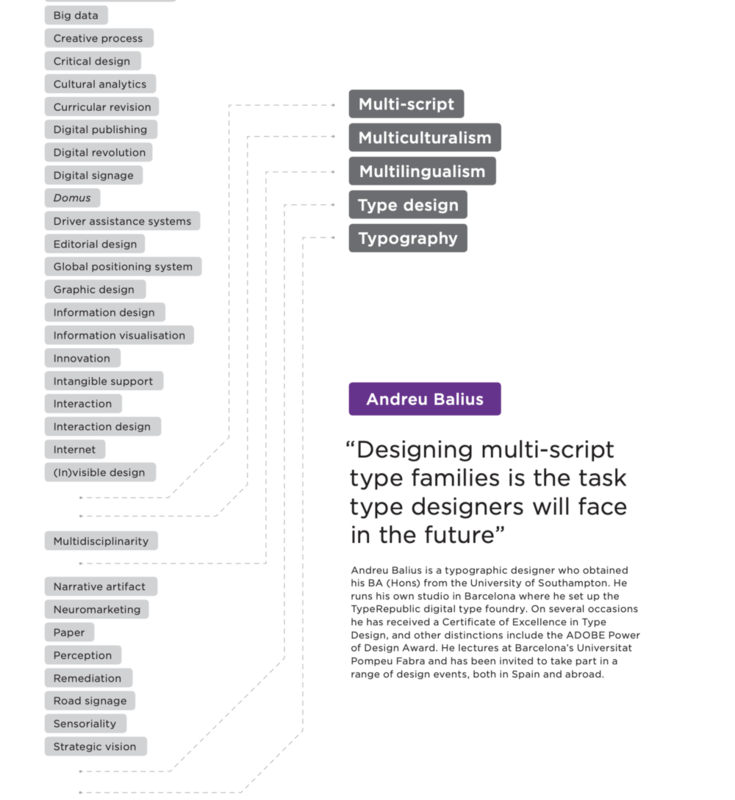 This paper provides a good overview of why typography is even more important in our increasingly interconnected world, where people of different languages or who speak multiple languages need better and more typography that function together. This book has some great essays about designing typefaces for different scripts, the essays were written by notable experts in each of the languages, Gerry Leonidas writes about Greek. The only thing to be wary of is that while the pictures in the book, while they are beautiful the authors of the articles weren’t consulted when choosing the photographs. This means that the images might not be the best reference of what the articles talk about. Regardless the articles are worth the book. These are books and articles that are worth a peruse and to know they exist but aren’t necessary for you to read them. This is not an exhaustive list of reading materials on the subject of typeface design. I will continue to add items to the list, and expand it as I find more resources that are useful. Please let me know if there are any specific topics that you would like me to add reading materials for, your input makes everything I am doing better.